Solemnity of All Saints - My Catholic Life! Martyrs were so revered in the early Church that their places and dates of death were sanctified by the candles, prayers, and votive offerings of the faithful grateful for their witness. So many were the martyrs, though, that by the early fourth century it became impossible to solemnize each individually on the Church’s crowded calendar. There thus arose, over centuries, and in different ways in different regions, the custom of commemorating the memory of all the holy ones on one specific day of the year. By the early eighth century, a feast of all saints was celebrated in Rome on November 1st. The Feast was extended to the entire Church in the next century. The universal sanctoral calendar of the Catholic Church is like a saint’s all star team. Only the most talented make the cut. There are many more canonized saints besides those on the universal calendar. Some saints are commemorated only locally or regionally, others are historically obscure, and still others did not give a sufficiently universal witness to merit inclusion on the Church’s universal calendar. The Church defines a saint as a soul enjoying the Beatific Vision in heaven. So besides the canonized, many more of the baptized are saints, although not officially recognized as such by the Church. These are the saints we celebrate in a particular way today. 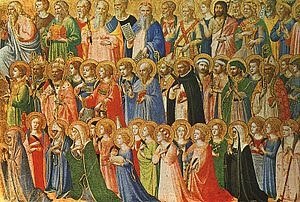 The Solemnity of All Saints commemorates all those holy men, women, children, martyrs, confessors and unknown others who lived lives of such holiness that they either entered directly into God’s presence in heaven or duly purified their soul of every imperfection in purgatory before living in the presence of God. All Stars such as Saint Augustine of Hippo and Saint Francis of Assisi stand shoulder to shoulder in heaven with forgotten grandmas, quiet uncles, and unknown martyrs. These unrecognized but holy souls did not convert entire tribes, found religious communities, or die in the jaws of lions in the arena. Maybe they just kept their mouth shut when they had just the right words to humiliate a family member. Magnanimity. Perhaps they cooked dinner night after night for their family out of a real sense of duty, while their mind was far away, imagining greater deeds making greater use of their skills. Humility. Or maybe they refused to cooperate with an immoral boss and lost their job, never to recover financially, their dreams ruined for a principled stance. Fortitude. The dense population of heaven is unknown to us on earth, but not to God, the audience of One we should most desire to please. There are as many pathways to God as there are people, since God wants to make a project of each and every one of us. All the saints lived heroic lives in their own unique ways. Some were the steeple in the village, the slender finger pointing to God seen by all around, inspiring others to greatness. But most saints had low profiles. They were like those strong square stone blocks in a building’s foundation, quietly holding up the entire structure. They received little or no notice or credit despite buttressing all the rest. Without them, the entire building, and all of its flash, would collapse. Today we commemorate those silent and sturdy ones whose support maintained the family, the marriage, the parish, the Church, the community, the faith. The communion of saints has its illustrious citizens who sparkle on their special days. Today we honor, remember, and seek to imitate the broader and more diverse population of heaven, the saints who have not been raised to the altars but who knelt before one on their earthly pilgrimages, receiving the Body of Christ and living His teachings in an exemplary manner in season and out of season until God called them back to Himself. All holy men and women, so close to us yet still so far, gather our prayers to yourselves and intercede in heaven on our behalf. May our holy desires be accomplished through that chorus of prayers you constantly present to the Father surrounded by all His angels in heaven.